De is our quadrille host this week and she’s greeting us with a kiss! Posted in Quadrilles. Tagged dverse Poets Pub, Kiss, Quadrille. Ohhhhh. This is wonderful, Kim. Such a gentle touch here, to all your words. Thank you very much, De! There’s something beyond the grave to this one, Kim. The Magritte is a little on the creepy side too. There is something that builds from that first kiss… somehow I see this kiss a bit chilling like a noose that’s slowly pulled around my neck… the painting adds a lot to that of course. I like the salt on the chapped lips – a little painful, but you know you are alive. I too like the salt on chapped lips. There is feeling in the pain, the brushing of the tongue across the lips that brings a slight taste of salt. Shows one is alive and hopefully. waiting for more kisses. Although the Magritte is a bit creepy. A touch of Poe in this one. The illustration is perfection, illustrating the message. It does not drop to the level of necrophilia, but metaphorically it is indeed chilling. Ooo, I can feel the tingles in this one. Wonderful write. the one to which the rest that follow will be measured. it had to be searing to hold that place of honor in your memory. it can also be a curse for others’ lips that follow… there’s a story here, i can feel it. I love the way that everyone sees a different facet! Thank you, Jade. Yes, it’s wonderful! You are welcome. I love both the image and “salt on chapped lips”. Really well done. At first I thought this was perhaps the memory of a first kiss, though the wonderful line the chapped lips hints at something else. Then it seems ghostly. . . I felt unsettled reading it. The Magritte is definitely creepy! It wasn’t my intention to unsettle but I’m glad it has some shadow. There is a lot of mystery within that kiss like salt on chapped lips, a burning or yearning. A first kiss that seems conflicted: chapped lips, but gentle fingers. The drama of lungs fit to burst, but then the endearment of “each little kiss.” Maybe most first kisses are ambivalent like that. I think as we get older, the kissing is not quite as passionate but it does remind us of how it used to be. Oh yes Kim, that was one to savor. Really enjoyed it! “a ghostly tingle that echoes” oh yes! Love the Joni album you posted in comment. Probably tied with “Blue” as my favorite. I have everyone of her slbums. Thank you, Rob. I also have all Joni’s albums. I love them all and can’t choose a favourite, although Blue and Court and Spark will always be close to my heart. Aww! It is rather reminiscent of the first kiss every time — breath held back, lungs almost bursting, the little kisses that follow the prime hesitant act. That “etched forever” made me smile. That image….oh my! Brings to mind “captured in love”….I’ve been watchng too many Castle reruns and other mystery shows. “like salt on chapped lips” is a visceral line….I can see the cracked lips and feel that burn. This kiss is one not to be forgotten….heart quickening. I just looked up the title….I admit I didn’t really know the meaning of it. “when two curved lines meet” —- ah now I truly see the connection to the image. Perhaps we can think that even when covered, with something between, these lips recognize the power in their meeting. A really interesting take on the poem….made more so by the image you’ve chosen. Did you write first and then find the image? Or find the image and then write? I forgot to also say….the holding of breath until our lungs burst comes in play with both the power of this kiss, this relationship, and the image! Thank you, Lill! I wrote the poem first and looked for the image. I was going to go with Klimt but I thought that would be too obvious. Ignore the art critics… Magritte rocks! Love it. that echoes” from that kiss. Kiss, Kissed, Kissing, what a sweet poem!! I have spent two days thinking about this post, Kim. 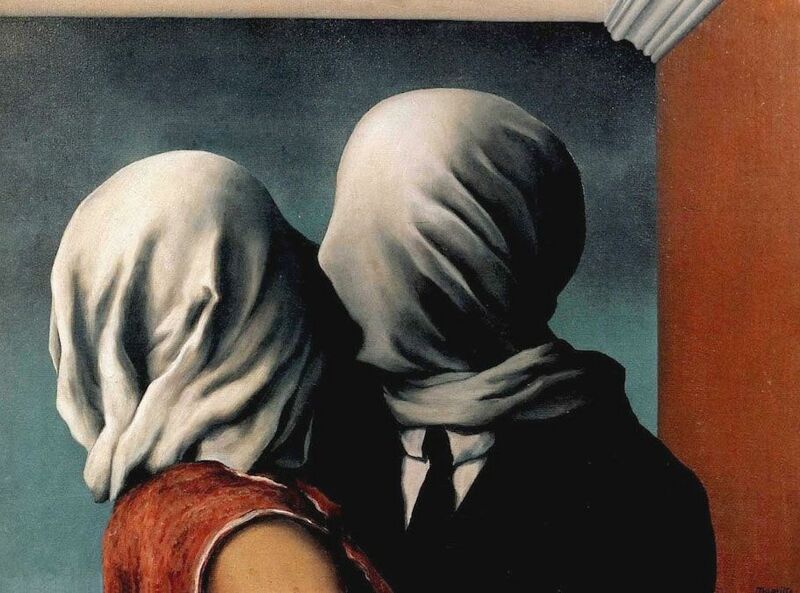 I think first of your choice in image – the Margritte – highly symbolic of that truth that even in a moment of great intimacy, we hide our true selves, shrouded like death and what we lose in intimacy is like unto death to us and our relationships. Then I go to your poem and see similar paradoxes; the kiss like salt on chapped lips – both stings and preserves, the lungs that give life with breathe are nearly burst, and all of these mysteries wrapped in the absolutes of geometry. This is superb writing. A haunting and poignant rendering, Kim! Well done!